Atlassian presents Bamboo 3.2 with release management, manual Stages and improved application linking. Upgrading to Bamboo 3.2 is free for all customers with active Bamboo software maintenance. You can download Bamboo from the Atlassian website. If upgrading from a previous version, please read the Bamboo 3.2 Upgrade Guide. Bamboo can be used for more than just continuous deployment. The entire release process can be automated by Bamboo with the appropriate setup. If you are using Atlassian's JIRA with Bamboo, you can now synchronize the release activities between these two applications. 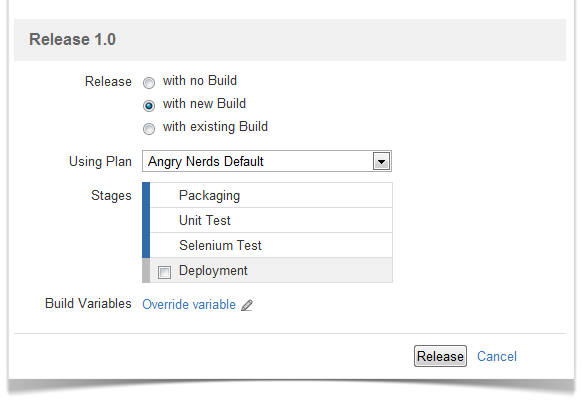 The new manual Stages feature also helps you to manage release activities, such as testing, deployment and the release itself, by allowing you pause the execution of your Plan at manual Stages. For example, you might want to use a manual Stage for the deployment to give your QA team a chance to perform a few manual tests before your software goes into production. Any Stage can be configured as a manual Stage. 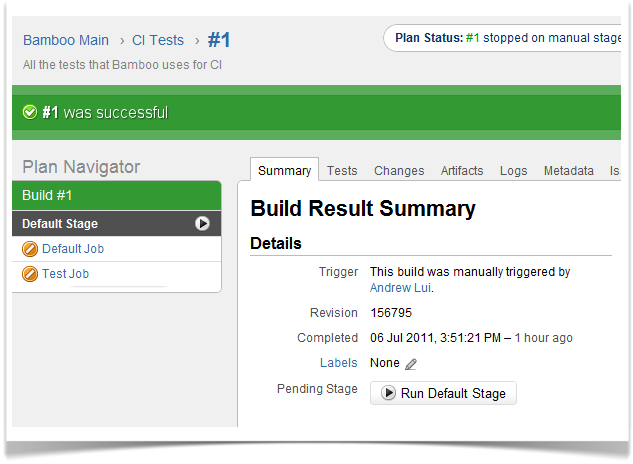 If you run a Plan with manual Stages, Bamboo will pause the build every time it reaches a manual Stage. The Plan build will only continue once a user has manually triggered the Stage. Sometimes, it's not your developers' fault. Builds can fail for all sorts of reasons that are not related to the code (e.g. infrastructure problems). If so, you may want to rerun the Stage that a Plan failed at, rather than start the Plan build from scratch again. We have provided you with the ability to rerun failed Stages in this release. Any Jobs that failed in the Stage will run again and the exact same data will be used. Is your dashboard or wallboard a confusing mess of Plans? 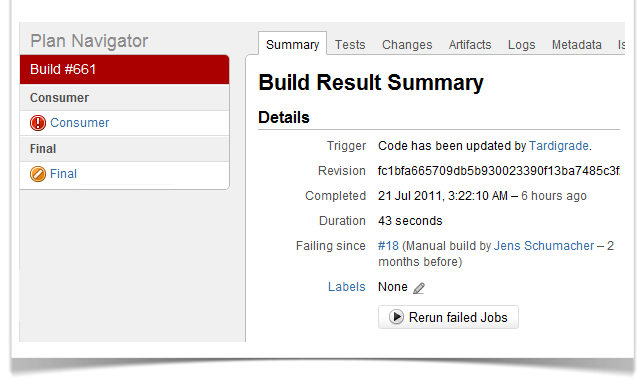 If so, you'll be happy to know that we've implemented Plan filters for the dashboard and wallboard in this release. 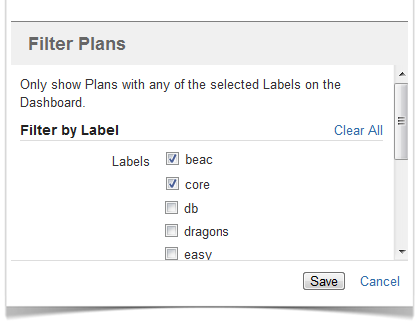 Simply label your Plans, then filter the Plans on your dashboard/wallboard by Plan label, as desired. You can now use the same set of users in Bamboo and JIRA, and manage your users and groups in JIRA. 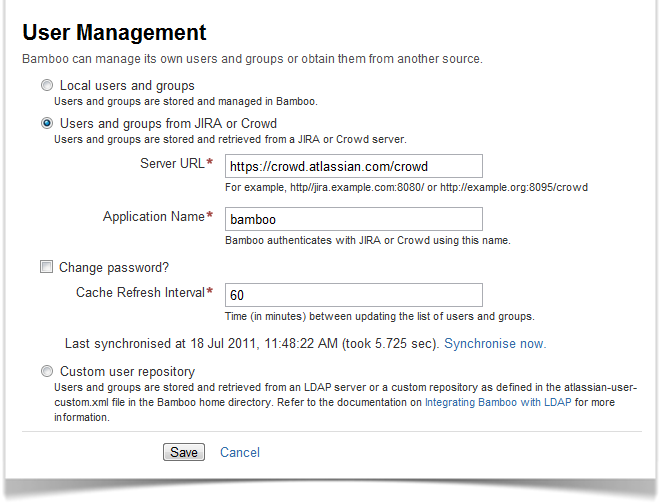 We've redesigned the user management configuration screen to make it easy to connect Bamboo to JIRA/Crowd for user management. If you use Bamboo with Crowd, you'll also notice a few improvements to the Bamboo-Crowd integration. We've bundled the Crowd 2.3 integration libraries with Bamboo 3.2. Try using Bamboo 3.2 with Crowd 2.3.1 and you will notice an improvement in performance, particularly if you have a large user base. Bamboo 3.2 bundles the new Application Links plugin. If you want to link Bamboo to JIRA to take advantage of the new release management feature, you won't need to mess around in the administration consoles of both Bamboo and JIRA any more. The Application Links plugin lets you create two-way links to other applications with your choice of authentication methods, from the Bamboo administration console.